My boy is a teenager. Actually he has been now for almost 3 months. He is certainly showing signs of growing up. And sometimes he's just a little kid. Confusing times for him, and for us. My blog, on the other hand, has been sadly neglected. 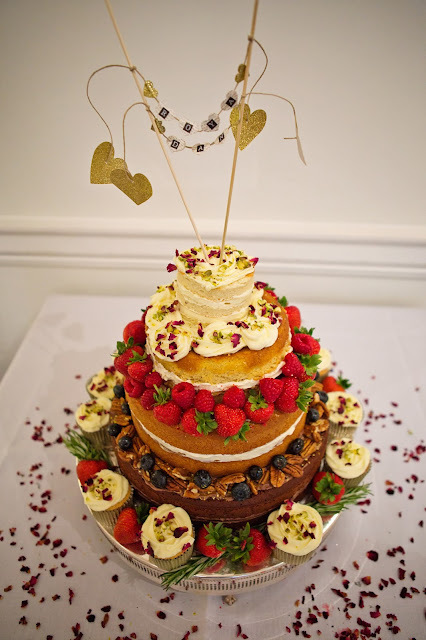 It has taken me 3 months to get around to blogging about a cake! Lots of other stuff going on at the moment, but hopefully after this academic year, I'll have a little more time to relax. 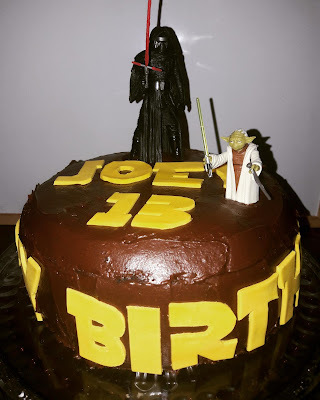 For the teenager's cake, he's recently become a Star Wars fan, so Nigella's chocolate cake, the go-to recipe for birthday cakes in this house was a given. Instead of spending days baking and decorating (something I do miss! ), the cake was baked in one evening, yellow fondant Star Wars writing quickly fashioned using an online image of the infamous font, and Himself was sent out on a mission to the toy shop to pick up the Star Wars figures. Sure, I could have made them! But coming back full circle to the first cake I ever made, it was decorated with toy dinosaurs if I remember correctly (and that's quite unlikely), so the cake was the gift too. Grown up though he (sometimes) is, he still likes to play with figures, so Yoda and Kai Lo Ren are now residing in his room, along with Rae and Chewwie. Happy (belated) birthday, young man.